A small, light-colored species with small eyes. Color typically medium yellowish brown, rarely dark yellowish brown. 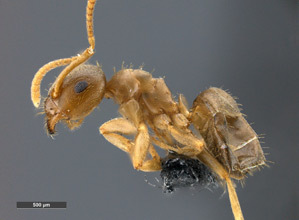 The scapes of the workers have hairs that are entirely decumbent, which separates this species from the somewhat similar co-occuring Lasius fallax. The latter has dense standing pubescence on its scapes. This species is limited to the lower altitudinal forest belts in the mountains of the Southwest, from juniper scrub at 7000 feet or less to mixed pine-spruce at 8000 feet. Judging from ecological notes accumulated by W. M. Wheeler, Cole, and myself, it nests almost exclusively under stones in dry, open situations. The type locality is situated in an area of open juniper scrub and scattered bunch-grass. 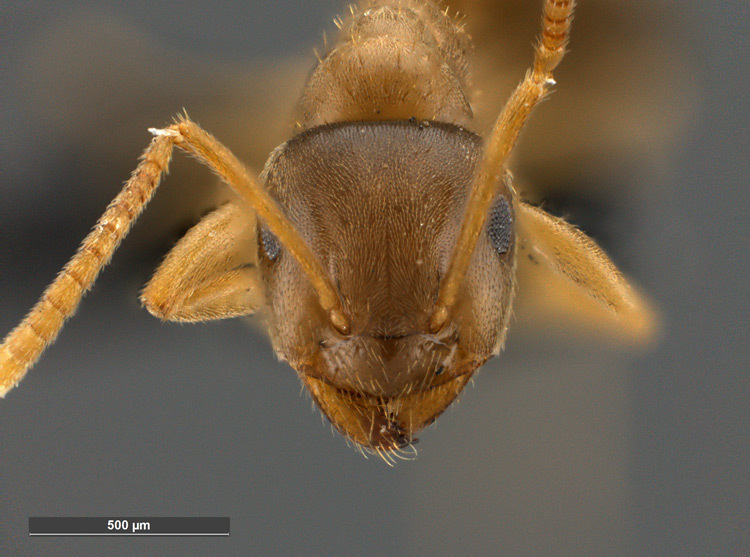 sitiens is co-dominant at this spot with several species of Myrmecocystus, Pogonomyrmex, and Conomyrma. At the base of the San Francisco Peaks, near Flagstaff, I found sitiens again abundant, nesting under rocks in open pine forest. In New Mexico Cole has taken sitiens primarily in pine forest and clearings bounded by pine forest. The ecological extremes in which he collected this species are as follows: near Los Alamos, a nest in an open, grassy area with scattered pine and juniper at 6400 feet; near Taos, a nest in moist pine-spruce woods at 8000 feet. The light coloration, small eyes, and shortened appendages of sitiens constitute a remarkable morphological convergence to the species of the subgenus Cautolasius, and specifically to the primitive species L. (C.) alienoflavus. There can be little question that the characters shared by these two species are the mark of a subterranean mode of life. At the type locality I was unable to find any workers foraging above ground either during the day or in the early night; in contrast, wherever the related species neoniger occurs its workers can nearly always be found above ground at any time of the day or night. No nuptial flights of sitiens have been recorded. Reproductives have been taken in nido on six occasions, from July 2 (Campbell Blue Creek, Apache Nat. For., Ariz.) to July 30 (Bandelier Nat. Mon., N. Mex.). This would seem to indicate an early reproductive period similar to that of L. crypticus. SW United States and N Mexico. Original Combination - Lasius sitiens - Wilson (1955). HOLOTYPE. A worker in the MCZ, selected from a nest series collected 20 miles north of Flagstaff, Arizona, on U. S. Route 89, July 25,1952, with associated winged queens and males (E. O. Wilson leg.). Paranidotypes in MCZ, USNM, and Creighton ColI. Wilson, E. O. 1955. A monographic revision of the ant genus Lasius. Bulletin of the Museum of Comparative Zoology at Harvard College. 113:1-201.